Always seeking to provide the latest innovations in lighting technology, 1000Bulbs.com is increasing its assortment of LED light bulbs and fixtures. The company will soon carry high-quality 2 x 4 LED troffers, U-bend LED tubes, 8-foot LED tubes, 2-pin and 4-pin LED lamps, and additional styles of LED Edison bulbs. As LED bulbs and fixtures continue to be developed in new shapes, sizes and designs, 1000Bulbs.com strives to make them available to its customers at great prices. Among the new additions to the site is a line of 2 x 4 LED troffers. Serving as direct replacements for old fluorescent troffers, these LED troffers take the hassles out of traditional office overhead lighting. They include an integrated driver for easy installation and are able to last up to 75,000 hours, more than twice as long as fluorescent alternatives, allowing customers to save on maintenance and replacement costs. These fixtures are currently being offered at just under $120 each, though prices are steadily dropping. For those who have larger, existing troffers, 1000Bulbs.com is also welcoming U-bend and 8-foot LED tubes to the site. To help customers replace their inefficient plug-in compact fluorescent lamps, the company is supplying 2-pin and 4-pin plug-in LED lamps. These plug-in LED lamps easily retrofit into a variety of residential applications, from recessed cans to sconces and ceiling fixtures. Lasting up to 50,000 hours and complete with an integrated driver, these lamps can be connected directly to the lamp socket without the need for a ballast and are able to provide customers with yet another way to save on maintenance and replacement costs. 1000Bulbs.com is also continuing to work towards providing LED solutions that look and feel more like incandescent bulbs. The company’s line of vintage-style LED Edison bulbs is increasing to include more bulb shapes that provide early 20th century lighting but with the benefits of modern energy-efficiency. 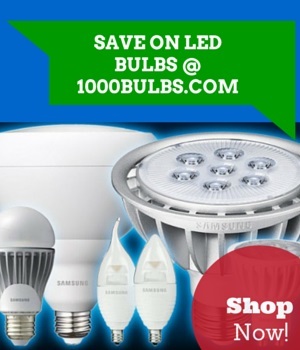 With its wide variety of cutting-edge lighting products, 1000Bulbs.com is proud to be a go-to destination for homes and businesses wanting to maximize their energy savings. All products therein should be available by early spring.